This week NZXT announced that their custom PC-building service, BLD, will be expanding into Canada. This is BLD's first step into an international market, and could hopefully signal further international expansion in the future. For now, Canadian gamers should be somewhat pleased with their inclusion into BLD's services. For those looking to avoid building a new PC themselves, BLD provides a more intuitive approach to building a PC. The customer starts off choosing what games they want to be able to play and what resolution they plan on playing at (1080 or 1440). After that, the service focuses in on the buyer's desired price range. There is a somewhat tiered approach here, allowing the user to bump the price a little higher or lower and see how the build changes. Once you've set yourself on a price point, you'll be able to customize specific hardware, then mix in some add-ons at the end if you so desire. The price points are nearly identical, with exception of BLD's $99 labor fee for the building of the PC itself. I like the visibility that BLD gives to the buyer on the actual price points involved, and it's even better to see that those prices align with the current cost of building the PC. Even with the additional $100 international shipping fee, it still looks like you'll be saving some money choosing to do a pre-built through BLD. As a long-time fan of NZXT, it's nice to see the BLD service growing and expanding, giving alternatives to those who prefer not to build the PC's themselves. 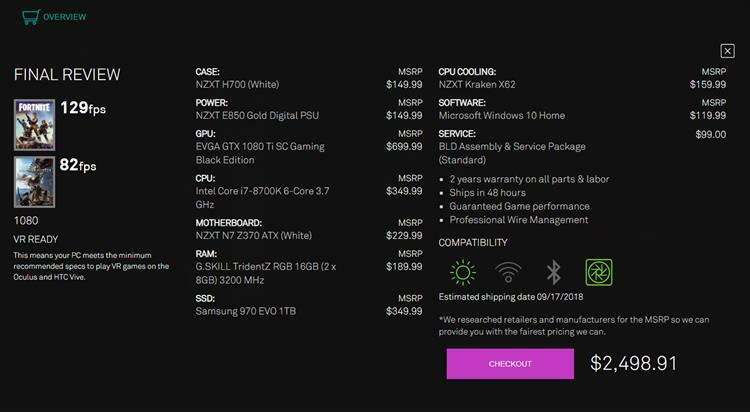 Los Angeles, CA – September 12, 2018 – NZXT today announced that BLD, the simplest way to get a customized gaming PC, is expanding its service into Canada. With BLD, Canadian gamers can experience a turn-key hassle-free solution to buying an affordable custom built PC that is tailored to the games they want to play with guaranteed performance. Part prices will be listed in United States Dollars and will be converted into Canadian Dollars based on the current exchange rate at checkout. FPS is calculated from OVER 10 million, and counting, analyzed gaming hours.